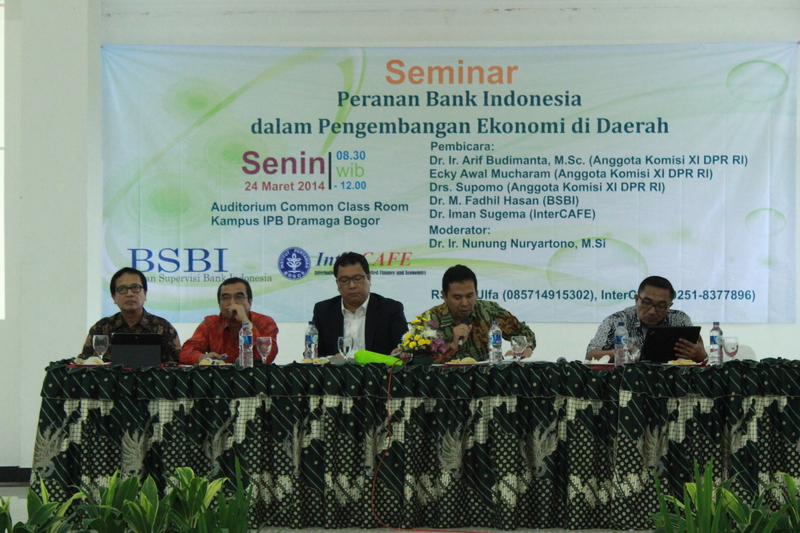 On 24 March 2014, InterCafe-IPB collaborating with Supervisory Board of Bank Indonesia (BSBI) organized a national conference “The role of Indonesian Central Bank (Bank Indonesia) in the Regional Economic Development in Indonesia”. The conference presented five keynote speakers, Dr. Arif Budimanta (Parliamentary member), Dr. Fadhil Hasan (Member of BSBI), Dr. Dian Ediana Rae (Director of Bank Indonesia in the Region of West Java and Banten), and Dr. Iman Sugema (Senior researcher at InterCAFE-IPB) with Dr. NunungNuryartono, Director of InterCafe , as the conference moderator. Dr. Umar Juoro, Director of BSBI and Dr. Anas M. Fauzi, IPB Vice Chancellor, officially opened the conference.